TOLEDO, Ohio, Dec. 4, 2018 /PRNewswire/ -- Welltower Inc. (NYSE: WELL), today announced new off-market investment volume of $1.0 billion at a blended cap rate of 6.4% comprised of 11 separate Seniors Housing and Medical Office transactions. This investment activity is in addition to the previously announced $80 million Johns Hopkins transaction and $400 million 23 asset MOB portfolio acquisition, totaling $1.5 billion in transactions announced since third quarter 2018. The Seniors Housing acquisitions consist of $725 million in transaction volume at a blended cap rate of 6.6% across four separate transactions. Three of these transactions build on relationships with existing Welltower operating partners. The Medical Office acquisitions consist of $280 million in transaction volume at a blended cap rate of 5.9%. This granular activity includes one large, trophy Outpatient Medical complex with 286k rentable square feet highlighted below. Welltower is under contract to acquire a 75% ownership interest in two state-of-the-art "Class A+" medical office buildings under development in Charlotte, North Carolina to be delivered in Q2 and Q3 of 2020. Both buildings are 100% master-leased to Atrium Health (Moody's: Aa3) for 15 years. This project is part of a 5.5-acre multi-phase health care anchored mixed-use development located next to Atrium Health's flagship Carolinas Medical Center campus. Once completed, these assets will house integrated specialty clinical practices for Atrium Health including the Sanger Heart and Vascular Institute. As part of this transaction, Welltower will form a joint venture with the highly reputable Southeast developer, Pappas Properties. The joint venture is exploring additional opportunities to grow in the region together and can further densify this project with up to 180k additional square feet. 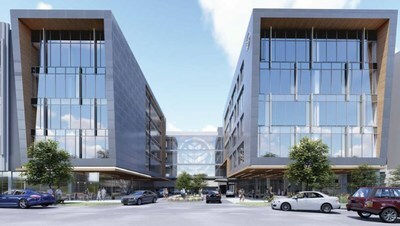 "We are delighted to have selected Welltower as our partner to develop two state-of-the-art medical office buildings, poised to deliver next generation care," said Peter A. Pappas, founder and CEO of Pappas Properties. "Welltower's immersive health care strategy, and their industry leading data analytics platform make for the perfect partner. These properties will serve as an anchor for our growing relationship." "Sourcing and executing on organic and cutting-edge investments are the hallmark of Welltower's differentiated strategy," said Shankh Mitra, Chief Investment Officer of Welltower. "We continue to strategically expand with our existing partners and find new high-quality partners with whom we announced over one and a half billion dollars in off-market transactions since third quarter 2018. We are very excited to start a new relationship with one of the most respected developers and health systems in the region, establishing a foundation for expansive future growth." Welltower Inc. (NYSE: WELL), an S&P 500 company headquartered in Toledo, Ohio, is driving the transformation of health care infrastructure. The company invests with leading seniors housing operators, post-acute providers and health systems to fund the real estate infrastructure needed to scale innovative care delivery models and improve people's wellness and overall health care experience. Welltower™, a real estate investment trust ("REIT"), owns interests in properties concentrated in major, high-growth markets in the United States, Canada and the United Kingdom, consisting of seniors housing and post-acute communities and outpatient medical properties. More information is available at www.welltower.com. We routinely post important information on our website at www.welltower.com in the "Investors" section, including corporate and investor presentations and financial information. We intend to use our website as a means of disclosing material, non-public information and for complying with our disclosure obligations under Regulation FD. Such disclosures will be included on our website under the heading "Investors". Accordingly, investors should monitor such portion of the company's website in addition to following our press releases, public conference calls and filings with the Securities and Exchange Commission. The information on our website is not incorporated by reference in this press release, and our web address is included as an inactive textual reference only. This press release contains "forward-looking statements" as defined in the Private Securities Litigation Reform Act of 1995. When we use words such as "may," "will," "intend," "should," "believe," "expect," "anticipate," "project," "pro forma," "estimate" or similar expressions that do not relate solely to historical matters, we are making forward-looking statements. In particular, these forward-looking statements include, but are not limited to, those relating to our opportunities to acquire, develop or sell properties; our ability to close anticipated acquisitions, investments or dispositions on currently anticipated terms, or within currently anticipated timeframes; the expected performance of our operators/tenants and properties; our expected occupancy rates; our ability to declare and to make distributions to shareholders; our investment and financing opportunities and plans; our continued qualification as a REIT; our ability to access capital markets or other sources of funds; and our ability to meet our earnings guidance. Forward-looking statements are not guarantees of future performance and involve risks and uncertainties that may cause our actual results to differ materially from our expectations discussed in the forward-looking statements. This may be a result of various factors, including, but not limited to: the status of the economy; the status of capital markets, including availability and cost of capital; issues facing the health care industry, including compliance with, and changes to, regulations and payment policies, responding to government investigations and punitive settlements and operators'/tenants' difficulty in cost-effectively obtaining and maintaining adequate liability and other insurance; changes in financing terms; competition within the health care and seniors housing industries; negative developments in the operating results or financial condition of operators/tenants, including, but not limited to, their ability to pay rent and repay loans; our ability to transition or sell properties with profitable results; the failure to make new investments or acquisitions as and when anticipated; natural disasters and other acts of God affecting our properties; our ability to re-­lease space at similar rates as vacancies occur; our ability to timely reinvest sale proceeds at similar rates to assets sold; operator/tenant or joint venture partner bankruptcies or insolvencies; the cooperation of joint venture partners; government regulations affecting Medicare and Medicaid reimbursement rates and operational requirements; liability or contract claims by or against operators/tenants; unanticipated difficulties and/or expenditures relating to future investments or acquisitions; environmental laws affecting our properties; changes in rules or practices governing our financial reporting; the movement of U.S. and foreign currency exchange rates; our ability to maintain our qualification as a REIT; key management personnel recruitment and retention; and other risks described in our reports filed from time to time with the Securities and Exchange Commission. Finally, we undertake no obligation to update or revise publicly any forward-looking statements, whether because of new information, future events or otherwise, or to update the reasons why actual results could differ from those projected in any forward-looking statements.